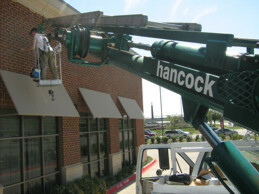 When your sign is inoperable - whether due to damage from high winds, traffic accident or simply Father Time, Hancock Sign Company can quickly resolve the issues and get your sign back in service. We understand how important signage is to a business and that a quick response is vital. Every minute a sign is out of the public's view is money out of your pocket and potentially damaging to a business's reputation. No matter where you purchased your signage or lighting, our service personnel can swiftly diagnose the problem, inform you as to the best options, and repair or replace any faulty parts as quickly as possible. Whether you require emergency professional assistance as a result of wind damage or signage failure, or need a regular schedule of routine sign or lighting maintenance, we would be happy to become your sign company. Hancock Sign Company makes the service process simple and stress-free for your business by handling all aspects of the job for you. Our company owns the equipment and employs the personnel ready to meet - and exceed - all of your signage requirements.